What Isn't Broken in American Higher Education? Some day, I am going to write a book in which I will discuss the laws that govern academia in America, and one of them will be: "U.S. higher education is widely regarded as the best in the world, which is why so many people want to change it." There is real truth in this statement. Even though hundreds of thousands of international students come to the U.S. each year to pursue college degrees here, often at enormous personal sacrifice, American higher education is increasingly under attack by politicians and the media. Why? There are real issues confronting colleges and universities in the U.S., such as ever-increasing tuition charges that have negatively impacted accessibility to a college education for lower and middle income families, and "mission creep" in which more and more institutions aspire to be the next Harvard or Berkeley. 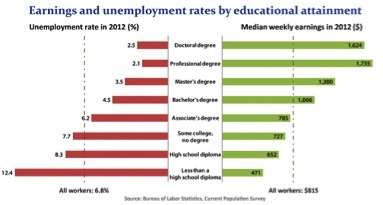 But the challenges confronting higher education are nowhere near as dire as those confronting our K-12 public schools. And some of the attacks on higher education, although in many cases well-intentioned, have the potential to do real damage to this sector of our national educational system at a time when a college degree is increasingly seen as the gateway to a meaningful and rewarding life and career. So, what isn't broken in American higher education? 1. In the U.S., we don't ask 17 year-olds to take a national competency test that determines whether and where they will go to college. In fact, a college education can be pursued by almost anyone who has a high school diploma or its equivalent at any age. 2. U.S. students can choose to pursue a college education at literally thousands of community colleges and public and private four-year undergraduate institutions, graduate schools and research universities with enrollments ranging from a few hundred to more than 50,000 students. 3. These colleges and universities offer an amazing (and sometimes bewildering) choice of academic majors ranging across the intellectual spectrum, from the traditional liberal and fine arts, science, engineering and business programs to specific career-oriented majors such as packaging science and game design and development. 4. These colleges and universities encompass a broad range of missions, from the education of the elite to the education of those from the most challenged backgrounds, and many in the latter category provide opportunities for social and economic growth for many of their students. 5. The cost of a U.S. college degree varies widely at both public and private colleges and universities, and almost all institutions have financial aid resources available to help those who need assistance. 6. Almost all U.S. undergraduate students, including those in the most career-oriented majors, are required to take many courses outside of their chosen field in the humanities and social sciences, and these experiences work to ensure that they receive a well-rounded education and to provide an educated citizenry for our nation. 7. The residential model of higher education employed by so many of our colleges and universities encourages a transition from dependence on the family to independence as part of the college experience, something that means as much to many of our students as the education that they receive along the way. 8. Most U.S. colleges and universities offer a wide range of student opportunities for engagement outside the classroom that encourage the development of social skills, promote healthy lifestyles, and provide leadership training opportunities. It may come as a surprise to some readers that many of these features of U.S. colleges and universities are not common in institutions abroad. And let's not forget that American college graduates, despite their lower achievement in tests of K-12 learning than their European or Asian counterparts, are competitive with the best college graduates anywhere in the world. So let's work for "continuous improvement" in our colleges and universities, but let's also work to preserve what's not broken.